What is critical thinking? And do universities really teach it? There has been a spate of articles and reports recently about the increasing importance of critical thinking skills for future employment. A 2015 report by the Foundation for Young Australians claims demand for critical thinking skills in new graduates has risen 158% in three years. This data was drawn from an analysis of 4.2 million online job postings from 6,000 different sources in the period 2012-2015. From The New Basics report by the Foundation for Young Australians. 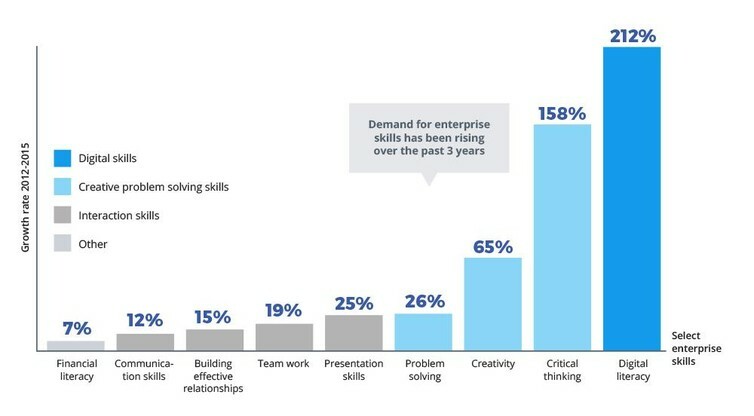 The report found employers can pay a premium for many enterprise skills. For example, evidence of problem solving and critical thinking skills resulted in a higher mean salary of A$7,745. This was a little more than for those with skills in financial literacy ($5,224) and creativity ($3,129). However, presentation ($8,853) and digital literacy ($8,648) skills appeared to be the most desired – or rewarded. Being a good critical thinker is a desirable trait for getting a job in today’s economy. Why wouldn’t it be? What business or enterprise does not want a good critical thinker? Actually, none of this is really new – although the pace might have quickened of late. Employers have long been insisting on the importance of critical thinking skills. In 2006, a major report by a consortium of more than 400 US employers ranked “critical thinking” as the most desirable skill in new employees. It was ranked higher than skills in “innovation” and “application of information technology”. Surprisingly, 92.1% regarded critical thinking as important, but 69.6% of employers regarded higher school entrants to university “deficient” in this essential skill. Employers increasingly recognise what is needed in graduates is not so much technical knowledge, but applied skills, especially skills in critical thinking. These skills are also said to be important within companies themselves as drivers of employee comprehension and decision making. What is critical thinking, anyway? But what is critical thinking? If we do not have a clear idea of what it is, we can’t teach it. It is hard to define things like critical thinking: the concept is far too abstract. Some have claimed that critical thinking is not a skill as much as an attitude, a “critical spirit” — whatever that might mean (of course it could be both). Others have suggested that it comprises skills in argumentation, logic, and an awareness of psychology (cognitive biases). But this does not help get a crisp and clear understanding. Whatever definition one plumps for, the next question that arises is what are universities doing about teaching it? Universities claim that they impart critical thinking to students as a “graduate attribute”. Universities like to think that students exit their institutions thinking much more critically compared to when they went in. However, what is the evidence for this assumption? Has any university pre-tested for critical thinking skills at admission, and post-tested upon completion of degree to assess gains? Not that I know of. There are well-validated tests of critical thinking that could be used for such a purpose, the California Critical Thinking Assessment Test being the most used. Others include the Watson Glaser Critical Thinking Appraisal and the Cornell Critical Thinking Tests. Why hasn’t this been done? I suspect because universities would be justifiably worried about what the results might indicate. In the margin — and tangentially — some (pessimistic) academics have countered that universities promote precisely the opposite of critical thinking; a culture of uncritical left-wing orthodoxy, an orthodoxy that takes the form of cultural attitude or milieu within the sector and which largely goes unchallenged. To counter these trends, a group of politically diverse scholars have set up a Heterodox Academy. They agitate for the importance of teaching students how – not what – to think. How do you teach it? There is some justification in the claim that universities do not teach critical thinking, despite their oft-cited claims that they do. In the US media recently, there was a heightened concern about the teaching of critical thinking in universities. This was sparked by a recent large-scale study – and later a book – using Collegiate Learning Assessment data in the US. The book provoked widespread interest and media attention in the US, especially on the topic of universities’ failure to teach critical thinking. It placed serious doubt on the assumption that critical thinking was being adequately taught on American college campuses. It created a storm of discussion in the popular media. And there is no shortage of studies demonstrating that “very few college courses actually improve these skills”. How, then, to define critical thinking? It is certainly not an easy question to answer. But perhaps a definition of it is, in the end, unimportant. The important thing is that it does need to be taught, and we need to ensure graduates emerge from university being good at it. One thing is certain: beyond vague pronouncements and including “critical thinking” among nebulous lists of unmet or hoped-for graduate attributes, universities should be paying more attention to critical thinking and doing a lot more to cultivate it.